Thread: What does your sketchbook look like? There used to be a thread like this but I believe it's so dead, that no amount of pixie dust is going to bring it back. I was just wondering if you drew or decorated your sketchbook, like on the cover or binding. And if you have a stack of SBs laying around, a picture of them would be awesome. I remember that Hurricane had about 10 SBs completely filled resting on his desk somewhere that he had filled within a year. I usually fill one up every 3 months or so, but lately it has taken a lot longer due to other engagements. So, in short, basically post a picture of your sketchbook cover design, how many that are filled, and how long it usually takes you to fill one up. Unfortunately, mine usually look pretty drab. I want to try painting on the cover of one of my sketchbooks. I do love duct tape. Uhh, all of mine are black. I tried painting mine this afternoon. It's still got a ways to go. I had several filled ones, but had to get rid of them to make room for other things (and termites might get to them. Ick). My current one has this logo painted on the cover in red gouache. Should've used acrylics. I haven't had experience with goache. And acrylics are awesome. They're what I've been using to decorate the front of my sketchbook. I'm pretty sure her left arm is too long, but I'm liking where this is going. Oh, some have dents in them, from being used in place of a drum pad. Sounds better. Just finished my sketchbook the other day and had the pleasure of decorating my new one. TBH i hope more people post pics in this thread, i like seeing what peoples workspaces and sketchbooks look like. I tend to make my own sketchbooks, from old clothes, cardboard and printer paper, its a really cheap and fun way to do it. ill take some pics and post them tomorrow, sleepy times now. Here is my current sketchbook, front and back. A little bit later than i said, but here they are. If I were to decorate my sketchbook, I would feel less inclined to fail in it. My sketchbook is hence called failbook. Mine aren't decorated either, they just look battered, a bit ragged and sometimes have cup rings on them from carelessness (or coffee stains). I always think I should be nicer to them but I reckon I wouldn't feel as free to draw any old crap in then. p.s the picture of Cranes shelf reminded me that I had so many books on my shelf it fell down the other week, luckily I'd moved my monitor over to my bed to watch a film, otherwise that and me would have been directly under it!... I was dead proud of my carpentry skills as well! I remember when the first "What does your sketchbook look like" came out, people posted whatever. It was a mix of bound books, loose papers, coffee napkins, everything. If there is a sketch in or on it, we want to see! 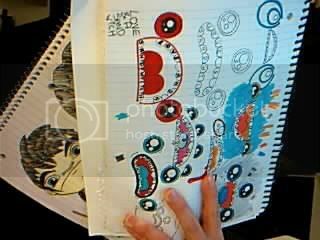 Like I said, I remember Hurricane showing a stack of sketchbooks he had filled in 1 or 2 years. I think it was close to 10. It's insane. So, everyone, no matter where or how you draw, POST YOUR WORKSPACE! Even if it's Starbucks or your uni campus. 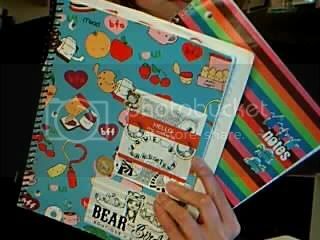 nice sketchbooks, I can't show mine. I'm too shy and it's very ugly. I don't really have sketchbooks, I have 'idea books'. I just doodle all my ideas for plushes, paintings, illustrations in them. Lined paper is less intimidating, and less money. I used to keep my to-do lists in them, too. Chelsea: Haha, ideabooks, I like it. I have no ideabooks just unfilled sketchbooks and 10,000 pieces of paper. I don't like drawing on lined paper if I can help it, it just feels weird, besides, normal print paper is only £1.50 for 500 sheets. Im thinking of making a A3 size one, for kicks. Psychotime: Not if you post pictures! even if its a tiny little postit note sketch...pad..thing lol. more random pics to come! I used to fill up sketchbook like crazy, and then completely stopped using them for a while outside of class. Now I'm starting to use them again everyday, so hopefully the habit sticks! Most of ^ are almost full. The green one, small beige one, and the SB on the top right are empty pretty much. Everything has been filled in a year's span. Need to step it up. Video games, blu-ray movies, and SD movies as well. Really just a bunch of junk I don't feel like throwing away. It looks different and unique. Don't bait the bots they have enough to deal with as it is.